Last Sunday saw Team Kyudokan’s first squad trials – and they were a fantastic success. Congratulations to everyone involved. 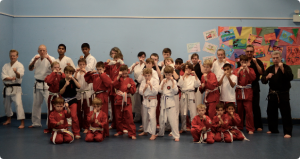 The trials were led by Team Coach Dan Fyfe and supported by Sensei Perry Bayliss who did an amazing job coaching students on all aspects of competition fighting. Everyone said it was a fun (but very exhausting!) training session – so we’re planning towards the next one. See you there!